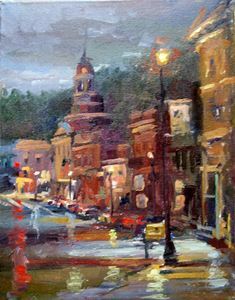 Congratulations to R Gregory Summers for his winning painting, "Thursday, This Must be Belgium", 1st in list. It was a very competitive vote with nearly 80 members casting their votes. oil on panel 18"x 18"
Patricia Rose Ford. Moon Over Avalon- 12x7 - Plein Air Pastel, painting on the Island of Catalina, Ca. The moon was full and beautiful. Richard Prather. Moon Over Telluride, 6x8, Oil. Location: Telluride, CO.